This is a picture of my Dad that I took on our great family vacation in January to San Francisco. He was laughing at the sea lions on the dock and didn’t even know I was taking a picture of him. I saw a random tweet by Kodak to submit pictures of your Dad to feature on their website and then have a chance to be 1 of 25 pictures featured on their billboard in Times Square. 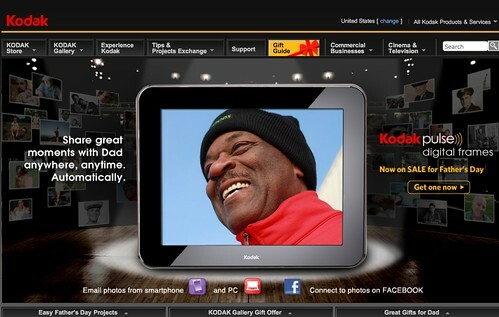 This is my picture on Kodak.com today! It’s only for today BUT my picture was selected as the 1 of 25 to be on their Times Square billboard! When I told my Dad his picture was selected he asked me if it was because he was so handsome, or if it was my photography skills. I told him it was 50/50 but in all honesty, I think it might be 60/40 and the 60 is leaning towards the handsome. A year ago I was just thankful that my Dad made it to Father’s Day. Now I’m so appreciative for every Father’s Day and day in between that I get with him. He wants to drive to NY on Sunday to take his picture with his picture on the billboard and I think that will be an awesome way to celebrate. And if you haven’t had the chance to today, tell your Dad you love him. I try to as much as I can. That’s awesome! What a great way to celebrate him! Awww, love it! And your dad IS quite handsome! This is fabulous!! Congrats Dana! What a great testament of your love for your dad! !